Do you enjoy Sims 3: Into The Future? I wanted to make my first post.. and its Sims 3: Into The Future Guide!! I will try to cover as much things as I can. I will categorize the guide. Each post under that topic includes different guides all about ITF. 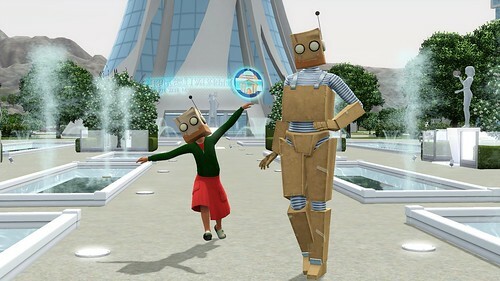 The Sims 3 Into the Future Expansion Pack introduces a new Futuristic World and Skills, Careers, Objects, Sim clothing and hairstyles to fit the style. I am writing this guide to help to explain you this expansion as much as I can. This expansion is last expansion for Sims 3 as Sims 4 is planned to be released 2014 Fall. I am playing in Midnight Hollow with my Gothic themed sim. Hope you Enjoy! As you load the game, the portal will come out of ground and zooms to it. For example: portal summoned in my garden. After inspecting the portal, Emit(The time traveller) comes out of portal. He talks with you and gives you the "Time Almanac"
..And then he gives you very very easy opportunity to complete and done! You can now enter to the future world! After teleporting to future, you will be amazed by the view. Flying cars, people flying around with jetpack, people using hoverboards,monorails and much more! The boom in Bot technology has left many Sims excited and fascinated by these complex machines. While many Sims are at home with their organic bodies, some would prefer to be a Bot instead. Simply, your sim can activate their simbot outfit by clicking on them and while the simbot outfit is worn, your sims can enter to Plumbot Competitions at the Bot Arena. When a pile of disjointed components rattle around a Sim’s head, they tend to be called “Unstable.” Your sim wakes up and gets “Impending Episode” moodlet. You need to take your sim to hospital or make it take deep breaths to treat it. This moodlet can last up to 6 hours, and if untreated, your sims will get “Delusional” moodlet for 24 hours. Once the moodlet changes from "Impending Episode" to "Delusional", one of the Sim’s traits will randomly change. Sims who are not treated for instability at the Hospital within 24 hours, they will risk a permanent change in their traits. There are a lot of high-tec objects in the future. I will share some of them with you. You can find windcravers in the bedrooms. Once you find it just put it into your inventory and in your inventory, right click and use it instead of walking. Enjoy your windcraver! It is faster than walking and very cool, for sure! Well umm.. She failed using windcraver and... no comment. This little ball.. It is simply amazing. It is more portable than laptop. You can use it WHEREVER you want! Internet is now holoweb from now on, in future. And sprites.. As usual, you can find some of them inside the Landing Community Center. You can summon your sprite and carry it on your shoulder, you can feed them with nanites. You can share and take sprites from other people as well. They are cute small portable animals you can have. You can even start a collection of them as well! Dreampods..they are very useful. You can make your sim wake up with a good mood or a bad mood. Its upto you! For example; If you make your sim see a flowing water dream, it will wake up with full bladder and needs to run for toilet. In addition, you can make your sim see a "Learning a new skill dream" so when it wakes up, it will gain skills faster! Your sim can now simply say the name of the meal it wants and Food Synthesizer does the rest! It is very simple and awesome machine. For programming meals to be better or making Food Synthesizer learn new recipes, you need to buy one to your home. You can buy one from the Imports Gallery. Not much to explain about. It is a cool new musical instrument you can play. Very cool and easy transportation system! You can travel fast by monorail. You can create nanites, trait chips and of course Bots with this machine! When you create a new bot, it will take you to the Create a Bot screen and you can style your bot there. It is quite fun! 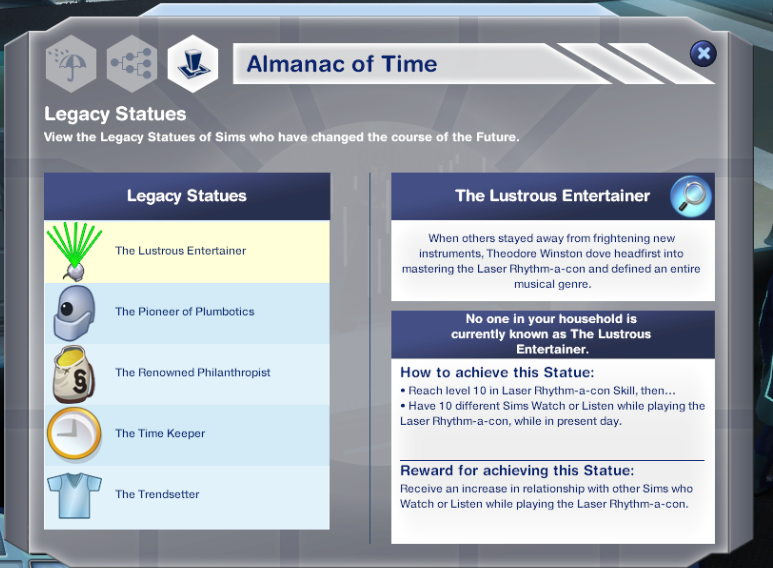 Legacy statues are rewarded to people that completes specific opportunities that Time Almanac includes. I will explain you how to get all of these Legacy Statues and rewarded with a statue of yourself and a moodlet for positive mood bonus! This one is clear. Just master the Laser Rhythm-a-con skill and go back to present. Throw a party with a lot of people and play your magical music instrument. After that you will achieve your own statue in Legacy Park! You need to master bot building skill first. After that produce or Tune Up a plumbot multiple times once you get your bot to "Future Tech" quality. Then you need to install the Sentience Trait Chip to your bot. You can make that trait yourself or simply go buy one at Bot Emporium. After that you will achive the statue and reward! First of all, you need to go to City Hall in future. After that Check Lotto Records at City Hall. Then go to present day and buy a lotto ticket from grocery. The more you buy, the more chance you win it. You will know if you lost or won the lotto at night. Do these steps multiple times until you win total 50000 Simoleon. Then in present day, donate the 50,000 Simoleon to Plan the Future Fund at City Hall. First, go to present day. Open your Time Almanac, trigger the Dystopia future event. After completing opportunities that emit gives you, trigger Utopia. Complete this oppurtinity too and then in present, summon time traveler and ask emit for help for fixing future. Complete this oppurtinity as well and done! Now you can trigger which future you want immediatly! First, you need to buy a clothing pedestal in present day. Set it into your present home. Throw a party at your home. Some sim will go near it and buy the clothing pedestal showing. This task is hard because people hardly buys clothing from pedestal. Good luck with achiving your very own Legacy Statues! !